The displays have already been revealed, but how will the foldable phone from Samsung actually look like? 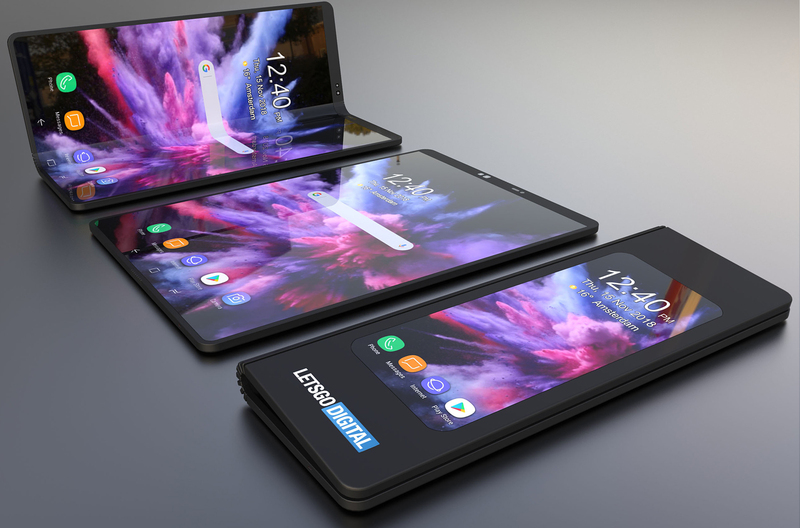 LetsGoDigital has visualized the foldable Samsung smartphone, today we present to you some exclusive 3D renders! 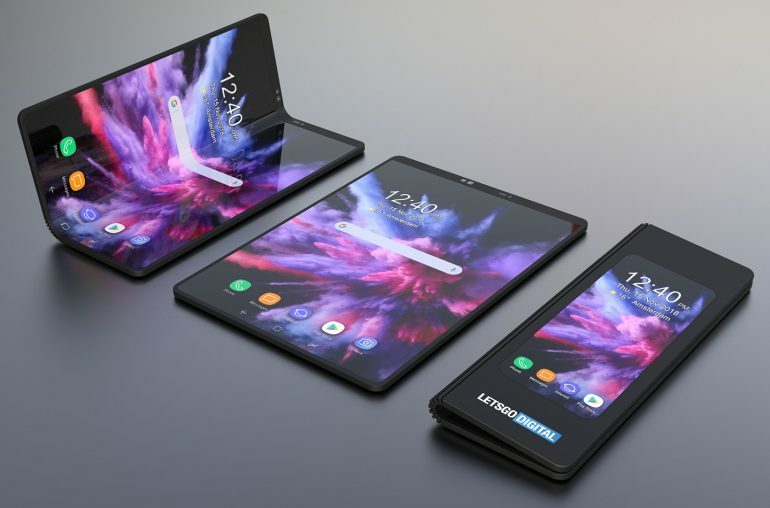 Last week Samsung released new details regarding their foldable smartphone, the alleged Galaxy F (or Galaxy X). At the Samsung Developers Conference in San Francisco, the revolutionary device was shown to the public for the first time. However, in fact only the display was revealed. The phone itself was packed in a dummy case, therefore the final design remains a mystery to this day. 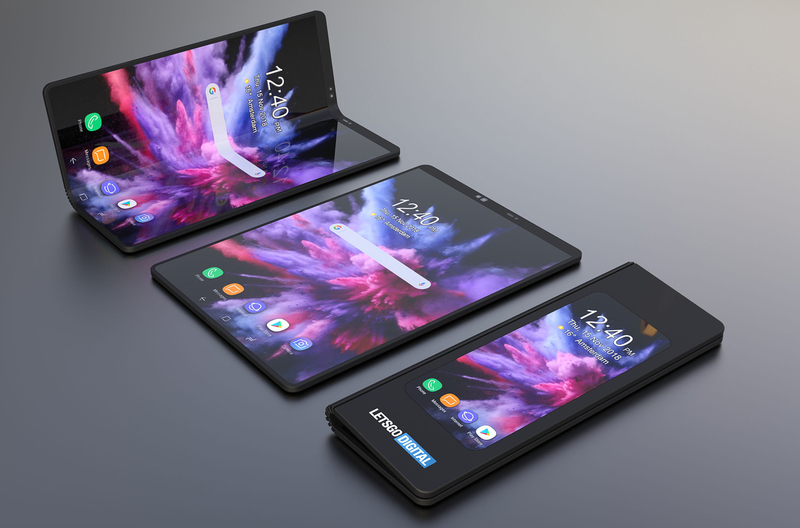 After all those years of rumors and speculations it is high time to visualize the foldable phone from Samsung. This way you will get a much better idea of how the bendable smartphone will actually look like. LetsGoDigital therefore designed some 3D renders. We have bundled all the information known to date to create the following Samsung smartphone renders. Samsung has already revealed the foldable smartphone will have two displays, which are significantly thinner than currently used in other Galaxy devices. At the front, the phone sports a 4.6-inch display with a resolution of 840×1960 pixels. If you open the phone, a 7.3-inch flexible AMOLED display with QXGA+ resolution (1536×2152 pixels) unfolds. Unfolded, the phone gets a real tablet function thanks to its large flexible display. Three active apps can run simultaneously without any problems. The cover window, which is placed above the display, will not be made of glass, but of transparent plastic. Although the foldable phone looked pretty thick in the used dummy case, you could notice that the device will get minimal bezels. Completely in trend with all current non-foldable smartphones. Nicely rounded corners -as we have become accustomed to from Samsung- will give the mobile device the final touch. Samsung has not only spent a lot of time and money developing a suitable flexible display and a corresponding user interface, the hinge will also become an important part of the overall user experience. The foldable smartphone must be able to bent over and over again, without causing any damage. Over time, LetsGoDigital came across various patents in which several types of bending mechanism were described. For the design of these renders we have opted for a hinge that has also been used in some of these patents, nevertheless it is possible that Samsung will eventually choose a different type of hinge. Although the final design has still not been unveiled, the Korean manufacturer has already indicated that mass production of Samsung’s foldable phone will start in the coming months, after which the device will come on the market in the first half of 2019. 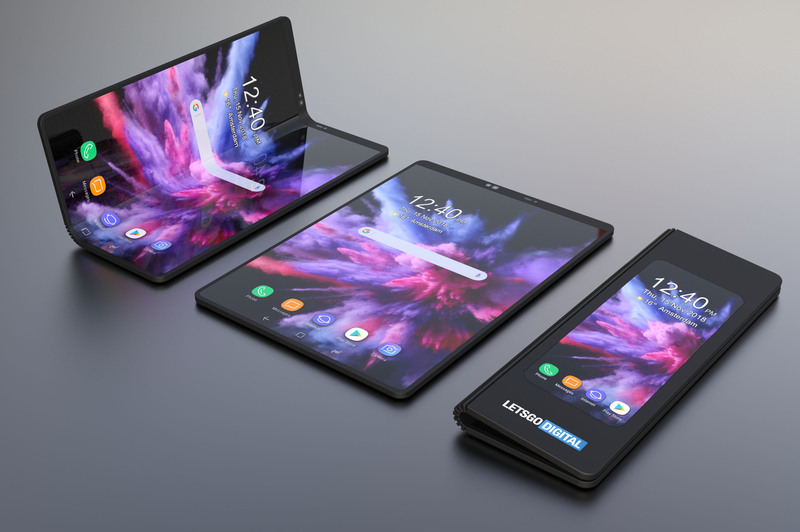 Some days ago, the Seoul-based Yonhap News Agency reported Samsung will officially present its foldable smartphone at the end of February 2019 at the Mobile World Congress 2019. 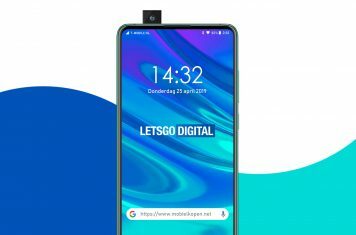 The official launch will follow in March 2019, simultaneously with the 5G variant of the Galaxy S10. This version will be released a month later than the 4G models of the S10. The Korean manufacturer plans to sell 1 million foldable smartphones, which is of course very little compared to the more than 317 million Samsung smartphones the company sold last year, according to an IDC report. Yonhap further reported that although the final price has not yet been determined, industry experts assume that the recommended price will be set at 2 million Korean won, about 1560 EUR / 1365 GBP / 1770 USD. Although this price is significantly higher than the current flagship model, it seems Samsung will have no problems reaching these sales figures. The Galaxy Note 9 with 128GB / 6GB RAM got a suggested retail price of € 1000. For the 512GB / 8GB RAM model you pay € 1250. However, the most advanced model seems to be sold just as often as the cheaper one. An additional amount of ‘only’ € 300 for a true foldable device does therefore not seem to be too much to ask for. Note for editors: The 3D renders offered in this article can be used for reproduction in any publication, however, we do expect a source link to our website. Thank you very much for understanding. You can download the original images here: 3D render, render II and render III.